What To Watch Thursday is Overdose’s weekly film injection: every Thursday we highlight film releases and film events that shouldn’t be missed! This week we head out of the cinema for two video installations. Anticipation: Continuing her longstanding interest in capitalist economy, Toronto-born artist Melanie Gilligan (b. 1979) lands her latest episodic video work The Common Sense in the Netherlands with a major three-part exhibition series. Most recently seen at Projections in Art Rotterdam, Gilligan seems to be the artist to watch in this country’s art scene this season. Appreciation: The final phase of the three-part exhibition across the Netherlands with Casco – Office of Art, Design and Theory (Utrecht) and De Hallen (Haarlem), Melanie Gilligan presents Phase 2B of ‘The Common Sense’ at De Appel Art Centre, Amsterdam. A miniseries comprised of fifteen five-minute episodes, The Common Sense unfolds a multi-character narrative at a time when the technological application The Patch allows companies direct communication with private emotions of employees and customers. Depicting a dystopian future that appears eerily familiar, Gilligan’s web series introduces overt critiques of capitalist economy, the changing forms of labour and how our modern day connectivity brings about palpable alienation. 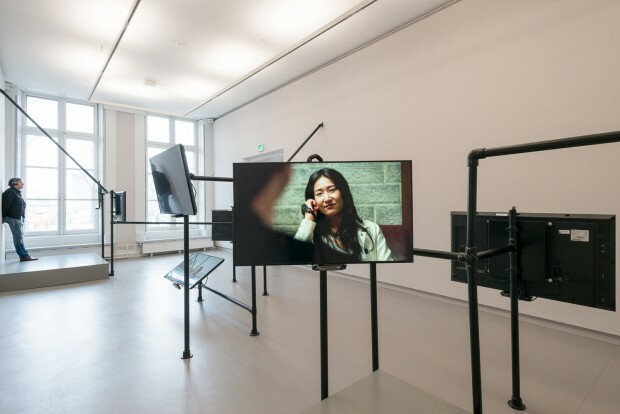 While the multi-monitor installation at De Appel Arts Centre is impressive in its slick delivery, the technological advancement the work comments upon may have better suited a web platform (like her previous work Popular Unrest (2010)) as an online miniseries, tropes of which Gilligan appropriates. Anticipation: Hot on the heels of last year’s major retrospective exhibition in Grand Palais, Paris, American video artist Bill Viola (b. 1951) is considered by many to be the greatest living artists working in new media. Following towering figures in art history (Rembrandt, Andy Warhol and Francis Bacon), Viola presents two video installations, the first moving image works presented as part of the Masterpiece series held annually at De Nieuwe Kerk. Appreciation: With his later work evoking divine presence, a church is the perfect venue for a Bill Viola presentation. Both originating from a 2005 opera production of Tristan und Isolde on which Viola collaborated with Peter Sellars, the two monumental video installations draw out familiar motifs – slow-motion, flat depth of field and an obsessive interest in the elements. Presented on a vertical screen, Tristan’s Ascension (2005) depicts the gradual levitation of a male figure accompanied by a roaring gravity-defying upwards waterfall. What follows on the same screen is a blazing fire surrounding a silhouette of a woman in Fire Woman (2005), an image that’s revealed to be a reflection on a water surface – the ripples of which slowly erases the flames. Although he’s known to be specific about the dimensions of his presentations, some flexibility on Viola’s behalf would’ve allowed for a truly engulfing experience with a larger screen and a better sound system – recently achieved by Sonic Acts in Amsterdam in their Vertical Cinema project. Feature photo by Janiek Dam. Installation photo by Cassander Eeftinck Schattenkerk.